It's a dream come true as Disney's Cinderella whirls with the Prince on a spinning, sparkling, musical dance floor. Cinderella's ball gown glows with twinkling lights and music. Fairy Godmother transforms her from rags to riches. Use Fairy Godmother's magic wand for magical effects. Change the pumpkin into a carriage, and music plays. Then make the glass slipper appear on the step. 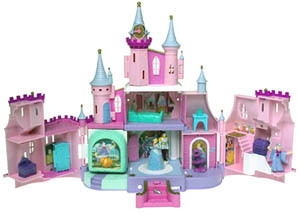 Includes castle, wand, chest with pillow and glass slipper, bed, dresser, magical staircase and 3 figures. Includes 3 AAA batteries.